Maud Dahme, a former long-term State Board of Education member, former local school board member in Hunterdon County and recipient of NJSBA’s lifetime education achievement award, spoke to students at the Hanover Park High School last week about her experiences as “The Hidden Child,” during World War II. 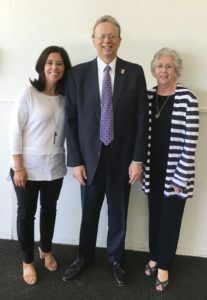 Dr. Lawrence S. Feinsod, NJSBA executive director, also participated in the program, part of the Hanover Park Regional High School District’s “Gallery Walk” service learning program on Genocide Studies. Dahme, one of an estimated 5,000 Jewish children hidden from the Nazis by Christian families in the Netherlands, was the subject of a PBS documentary on her experiences. Gallery Walk involves students at both district high schools, Hanover Park and Whippany Park. Visitors enter under a replica of the Auschwitz gate, then weave through classrooms with displays, created by students and staff that recall various incidences of genocide. The Gallery Walk program won a National School Boards Association Magna Award this year.